Here it is past the middle of May and I haven't even jotted a tittle of a post for you. It's not meant as a lament but I keep being surprised at how the weeks and months are slipping by ... the days skittering like glass beads from a broken silk thread. Just a few days ago it was January, now it's May. Is it just me, or do you find it that way too? Sometimes I create pressure for myself about writing a post because I want something that will be some wonderful piece of writing, as if maybe I need to impress someone. So I mull and dream and pencil chew, hoping for words that inspire, create hope, and share a little fun. I don't need to impress anyone. I don't need to impress you, do I? I mean, you and I share similar pleasures for so many of the ordinary, simple things of life, that it makes me wonder where this strange feeling comes from and why I let it keep me from writing however 'ordinary and simple' it turns out to be. And, then there are the times when there is the added pressure when pangs of woe close in -- whether these are my own personal little anxieties or those of people I care about or it comes from those sad and hurting faces I catch sight of in the media. These are times when I feel the weight of too many words and too much information. Some people turn to their writing as a way to discover and work their way through hard times. I get quiet. I crave silence. And beauty. Petting a kitty. And connecting with creation's healing properties. Praying. Writing is not my first go-to place for dealing with deep anxieties or sorrows. If a person ever caught sight of the inside pages of my journals, they would see the evidence: words regarding troubling situations are sparse -- details are sketchy. ... the weight of the world that stops me from sitting down to write these days. For right here in our own beautiful province of Alberta, eighty thousand people became displaced from their homes and community as we watched their city of Fort McMurray and surrounding areas burn with fierce and uncontrollable wildfires. Even though I or my family are not personally involved in this devastation -- I'm hundreds of miles from that region -- yet the impact is very real to my own heart and mind. We do grieve for the sorrows and losses untold, and for lives turned upside down for so many people. Yes, there are bright spots. Thankfully. I'm so glad for Helen Keller's thought. For, in the middle of it all, we have been proud to witness the strength, generosity, and compassion of thousands, including our amazing governments, towards the families and businesses personally impacted. 'Alberta Strong' resounds as the anthem for everyone in our province, not just the Fort McMurray evacuees. Together we share the sorrow, together we experience the overcoming of it. We are strengthened and encouraged. 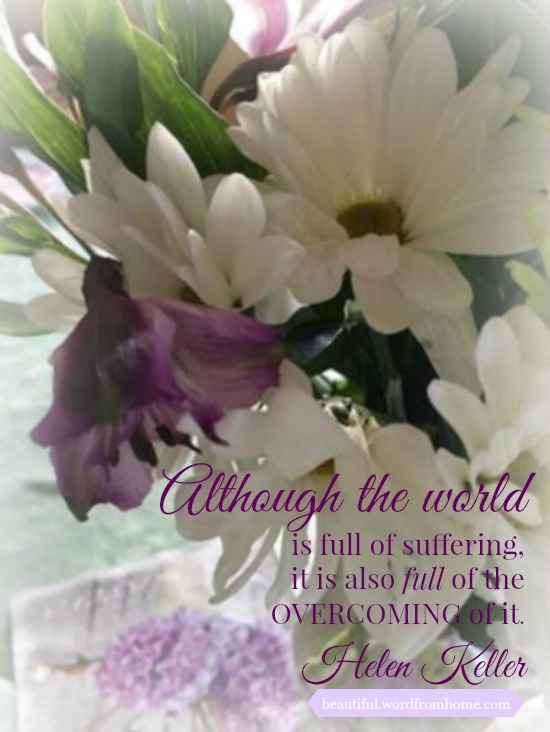 Lest you think we let sorrow and suffering be the victors around here, I want to share a few things that are filling my heart with joy these days -- my 'grace note' moments that remind me we're not alone, we're in this together, and I can continually cast my cares on the Lord Jesus. C.S. Lewis once said, 'Joy is the serious business of heaven'. Always longing for glimpses of heaven in unexpected places, I take seriously the business of filling my days with joy splashers. Susan Branch refers to these gifts as life softeners. Yes. That fits. Aren't we all grateful for such gifts to help lighten loads? maybe your soul has never been in bloom." Spring unfolds with not the same zip and eager freshness that is usual. Every bud and leaf must overcome a several season drought. One feels the labour of Spring's unfolding this year. 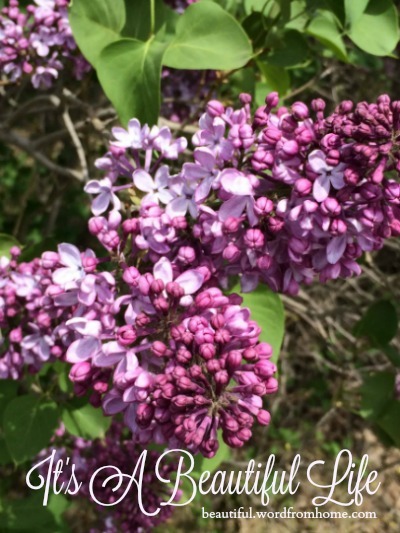 Yet... lilacs and Mayday and Plum trees blossom out and fill our neighbourhoods with fragrance of the most heady kind. The fragrance one can never quite breathe in deeply enough to get its full essence. What joy to catch a whiff on the wind or to bury our nose in the perfume drenched branches. What with such a strangely mild, snow-less winter and warm Spring arriving much earlier than is usual, it now feels much later in the season. More like June. Which is why I started wondering where all the summer birds were ... were we this Spring to be without moisture and our usual share of migrating birds coming to nest and sing their lovely songs? Now that would be something to lament. I would feel bereft and lost without by my little bird friends. Especially the little Tree Swallows with their iridescent black tuxedos. Not to hear them chortle and chuckle as they 'discussed' plans and performed mating rituals? Then one day this week, a pair swooped in and laid claim to a nest box (photo from a previous year). Click to listen to their calls. Almost on their tail feathers arrived the White-Throated Sparrows with their pretty melodies, not to mention the jolly red-winged blackbirds who will fly up to our feeders from the lake down the road. I always think it's cute the males announce their arrival when they visit, while the females slip in and out without fanfare. Oh joy, oh bliss! Hands up with glee and me saying, Thank you, God! The world around me is coming right-side up. 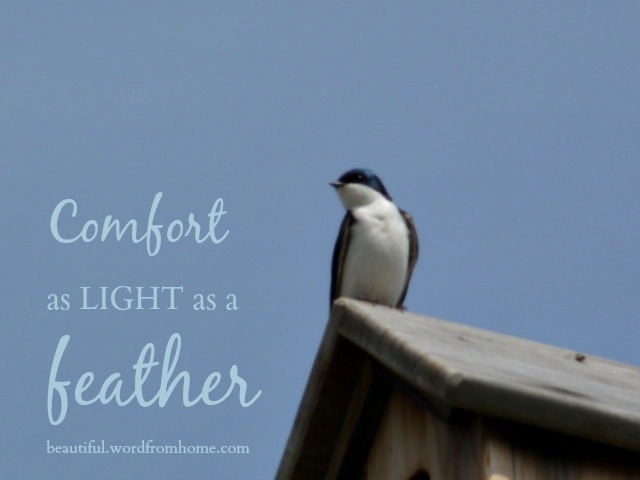 It's comfort as light as a feather. I've been trekking with Susan Branch via Twitter as she and her Joe wend their way across the USA on her current book tour. My goodness, so many exciting things happening for this beautiful lady. After all the many months of hard work, Susan is certainly experiencing the sweet harvest of all her labour and faithfulness to sitting on the chair at her art table every morning. 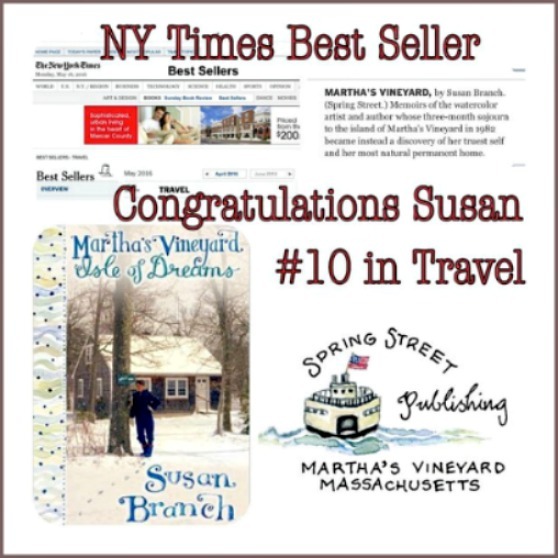 First, there is the excitement of going on tour to share her newest book Martha's Vineyard: Isle of Dreams with fans. Then she tells us that the Movie-TV Rights for the book have been sold (so there's a possibility of a movie or TV series coming down the road -- how cool is that!). And if that isn't enough for the 'Fairy Tale Girl', she finds out Isle of Dreams is on the NYT bestseller list under Travel (a first for her books), and she's been invited for interviews on television in Kansas City. I'm as excited for Susan as if these would be mine own 'dreams come true'. How much beauty and hope she has given her world ... and to us, her fans and Girlfriends. I'm celebrating these red letter days with you, Susan! Click HERE for her latest interview. 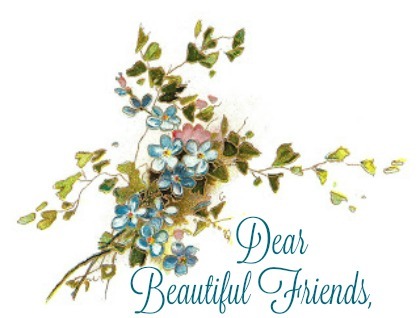 Before another word gets said, I want to take this moment to thank each of you for your beautiful comments on my recent posts. 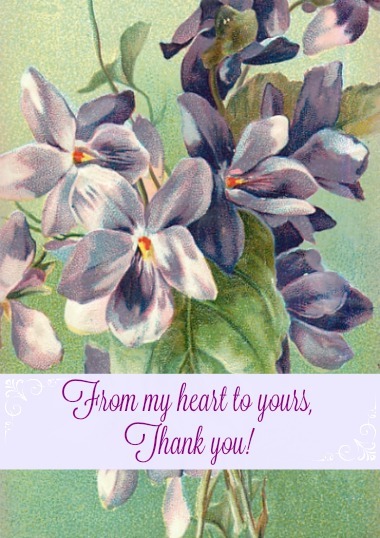 Although I haven't been posting or visiting much lately, I am grateful for your presence here, and I cherish the time you've taken to write such lovely things for me and our beautiful readers. 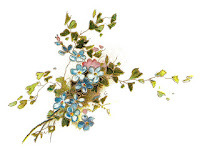 Grace notes most elegant! You make my heart sing. I appreciate you so much. We were some excited when the book The Natural World of Winnie-the-Pooh by Kathryn Aalto arrived in the post the other day. I first saw it being talked about on Twitter, and when I came across a review that said it was a perfect antidote for stressed living, I knew I wanted to read it. 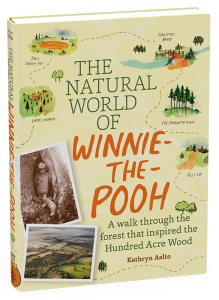 Besides, for someone who still loves Pooh and Piglet, Tigger and Christopher Robin, this book is a lovely reminder that the Hundred Acre Wood is real and still very much alive as it gives its readers a magical behind-the-scenes visit to A.A. Milne's world. How perfect a book indeed to stir English imaginings as we begin the serious countdown to our trip to England. We'll actually be in the area on one of our garden tours, so I'm really hoping to catch a glimpse of Pooh's stomping grounds. Have you ever read Christopher Milne's memoir about his childhood and his father, A.A. Milne, called The Enchanted Places? It's a lovely book and I have a soft spot for it still even though I read it years ago. There was something Christopher said about his dad gave me an insight into my own dad and it helped me to understand him better. Now it's on my look-for list when I'm in England -- I hope I find a copy to add to my library. So often it's the little things that add a lot of happy to our world, isn't it? And when I found this wonderful easy-on-the pocketbook shower curtain, I knew I had to bring it home with me. 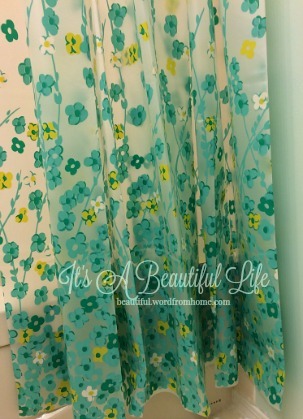 Not only does it fit perfectly with the bathroom's soft aqua walls, I love it because it reminds me of a summer meadow ... and a pretty vintage dress with a soft twirly skirt. Maybe even something that Sidney's heart love, Amanda, might wear walking on a summer's eve, after Sidney and Geordie finished solving the latest mystery in Grantchester, UK. you cannot walk through and breathe those smells and remain angry. We have to support the BEAUTY, the poetry, of life. seem odorless but altogether PERFUME the air. brings PEACE upon your soul. and run around the meadow naked. When I started working on this post a few days ago, it was so dry in our province. Tinder dry. But today, I'm so grateful to report it's raining. Nice rains ... gentle, yet frequent. My window, where I'm oft sitting to peer out into my world, is drenched in rain drops and rivulets. Lovely. An aside ... I just learned something new today. That word above 'rivulets' -- all my life I've been thinking it was 'riverlets'. Haha! Rivulets = a very small stream. Did you know that? I hope I'm not the only one. Well, m'dears, I best be calling this a wrap before another day goes by. Please know I'm wishing you glimpses of heaven in unexpected places and a wonderful weekend ahead. Hello, sweet Bren! Dropping in for a bit of thoughtful writing and inspiration! These are, I don't want to say dark, challenging times in the world. Yet, we know Whose Hands hold ours and we will walk through this time. I was amused by a church sign this week: "Last time things were this bad, I sent a flood, Love, God." Isn't that droll? Matty, that book "Home is Heaven" sounds wonderful. 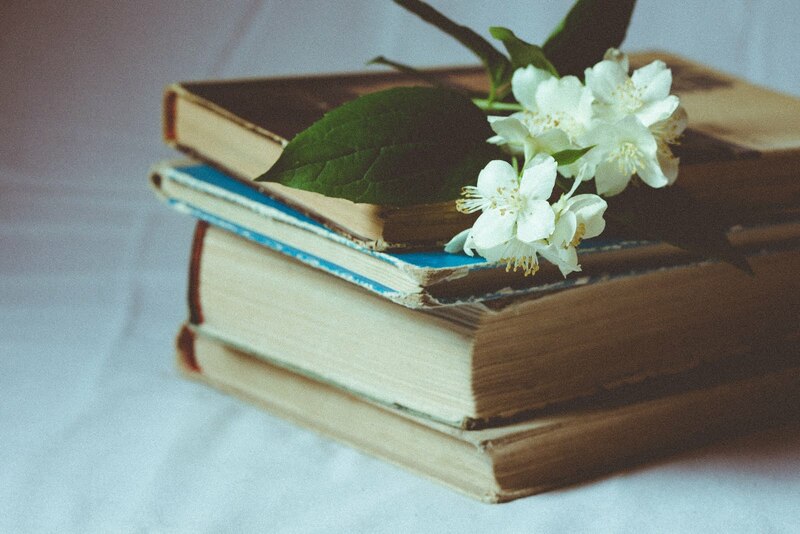 I love books that keep their freshness through the years. I'll have to go looking for a copy. Chuckle at your comment re the church sign. Thanks for stopping by... wishing you a lovely weekend. The longer I know you, the more I believe we might be 'bosom friends' if we were to meet in real life. 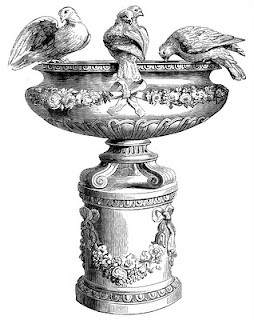 Birds, Winnie the Pooh, Susan Branch, Grantchester, Jesus -- so much in common. Thank you for this lovely read. Your spirit shines through like a bright yellow buttercup on a rainy day. Oh Margaret, how wonderful to get your message. And to meet another 'kindred spirit' whose hearts beat in tune with all that is beautiful, especially the One who made it so in the beginning. A bright yellow buttercup ... that makes me smile indeed! Thank you for your kindness. It's been awhile, it seems, since we last connected but this lovely post drew my along from thought to thought just like those birds you mentioned. Hi Bren! Just stopping by from Twitter! What a lovey blog post! You do speak words from the heart that bring joy and a sense of peace. I love your little quotes from A.A. Milne. Big fan here! And your comment about your shower curtain being something that Amanda might wear in a little vintage breezy dress made me smile! I can totally see that! I love Grantchester and, if I were 30 years younger, would have a HUGE crush on Sidney! Oh my! What a darling! �� Have a nice weekend and thank you for sharing your heart. Karen, How lovely to hear from you. It will be interesting to see what unfolds with Sidney and Amanda in Season Three -- I loved the last scene of this Season's. A lovely post and pretty new shower curtain. Although Winnie the Pooh was read to our children, my favourite childhood book was The Wind in the Willows - probably why I love the critters in nature so much. The mention of the birds singing again in Fort McMurray touches my heart - something beautiful for those poor people. I just started watching the premiere of Grantchester on Vision TV this week and hope they'll take us through all of the series so far. I read Enchanted Places just last year and got a new understanding of what it must have been like to grow up named for a beloved character, or I guess the beloved character was named for him. May I say that this was a lovely post, beautifully written but I love the spirit of it too. It resonated with me. And I must not put off becoming familiar with Susan Branch's work. I see her fans everywhere and I understand that she loves one of my favorite people, Gladys Taber. And thank you for the link to the bird site! I listened to the dawn call of the tree swallows, a bird I have never seen and have pulled the page to my desktop to visit again. It was interesting to read that you don't often journal about the worries of life. I did when I was younger but no longer do. Maybe I'm thinking ahead now to what my children will think if they read them someday and want them to see more of the joys I felt, not my blue periods? So much to read and such a wonderful post. Thank you! Lovely to hear your voice on a Friday night, Brenda! It sounds like all is coming right in the world again--deer and birds in Fort McMurray and rain! Loved your Winnie the Pooh quotes, and the new shower curtain! Happy Spring! I so enjoyed reading this lovely post. How interesting you mentioned Susan Branch! I'm just finishing "A Fine Romance". (I started in the middle of this trilogy, went to the Fairy Tale Girl, and now finishing with England. I'm going to put the Pooh related books on my list to read next. You certainly made up for the time off from blogging. I'm afraid I turn almost naturally to writing when stressed when I probably should hold back and write things more beautifully (as you do here). It's been a delight reading this post. I'm a huge collector of quotes. "Zingers", I call them and will add a couple of these to my collection. your posts are always worth the wait:) thank-you. SO many favorite parts. I esp. 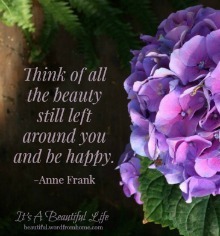 enjoy the quotes and what gorgeous photos you have! linking to your post today. Time is flying by for me too! Susan Branch's travel books is on my list of books to read (too many books, not enough time to read them all!). 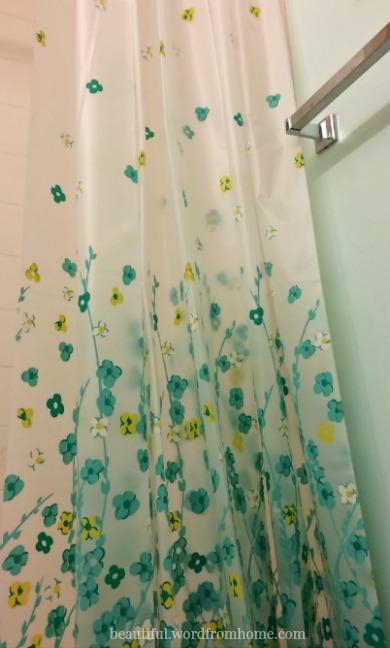 Love your pretty floral shower curtain. I agree that it's the little things that can brighten our lives (my weakness is cute tea towels). Thanks for introducing me to the terms "joy splashers" and "life softeners". Enjoy the long weekend! Hi Brenda, I thought I was alone in my silence. When I am anxious, I don't write either. I find it really difficult to talk about it or write about it. I thought it was interesting that you struggle with the same thing! Anyways, I appreciate all the little beauty splashes you shared - it cheers my heart too! I had a china mug of tea at hand when I opened your post and sipped as I read through. A lovely post full of good things as well as the realities of life that can hit us hard. I'm so happy to hear that rain is falling in your province and I pray for a good dousing. Enchanted Places is a book that intrigues me and I'll be looking for it. How interesting to read that you don't write when down. 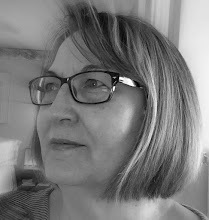 I find that I avoid writing when something bothers me, but things often come to a point when I have to untangle and sort out my thoughts and the best way is through writing. How unique we all are and all loved so dearly by our wonderful Lord. Not too long until we both visit England. I'm getting so excited that I have to push the thoughts away in order to focus on what I need to do today. We have our reservations for travel and staying all settled, now is the fun of deciding what we will see. There's a wealth of beauty and history that leaves me almost unable to choose. Will be fun to see what you decide on. Enjoy the planning! Thank you for sharing a bit of your lovely heart with us, Brenda. Your posts are like a chat with a good friend. Oh, there you are. I've been waiting for you! Seriously, I thought you were on vacation, like Susan Branch. Don't you just love her? I read her recipe books like I would any book, page by page. Sometimes I get in a "stale form" of blogging. Things are happening but my fingers just don't up them down. By the way, your shower curtain does remind me of a summer dress from the 50's. It's perfect. The sorrows of life are many. How blessed to have those bright spots sprinkled in between. Sending prayers for those displaced by fires and, in our case in this area, those still displaced from recent floods. Dear Brenda I so understand when our hearts are burdened for another how difficult it is to write. As always though your post is so full of warmth and lovely joy. I am praying for your dear country men and women. All we need to do in this life when we are feeling a wee bit ungrateful or sorry for ourselves to look up and around and see those who are hurting and in deep need. Bless you for this lovely post. Hugs! I've just finished reading your post, Brenda, and already I want to read it again. There is so much to think about. No need to worry about impressing me, job done, and the Pooh-lunch quote is a keeper. So I'll just make myself another cup of tea and once more around the block. "but I keep being surprised at how the weeks and months are slipping by ... the days skittering like glass beads from a broken silk " , exactly how I've been feeling lately. Where does the time go and how has it slipped by so quickly ? I will keep the words "joy splashers " in mind now as I look forward to the coming days of the hard work of moving . I know every day if full of joy splashers, one only needs a thankful heart to find them anywhere.